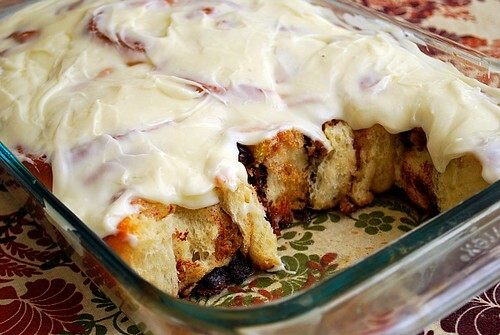 Cinnamon rolls are such an indulgent way to enjoy breakfast. All that cinnamon sugar goodness rolled in between fluffy sweet dough and topped with a rich cream cheese frosting is hard to resist! But what about taking it a step further by adding more surprises within those rolls? 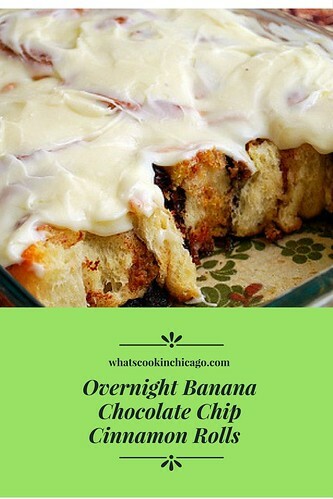 What about bananas and chocolate chips? 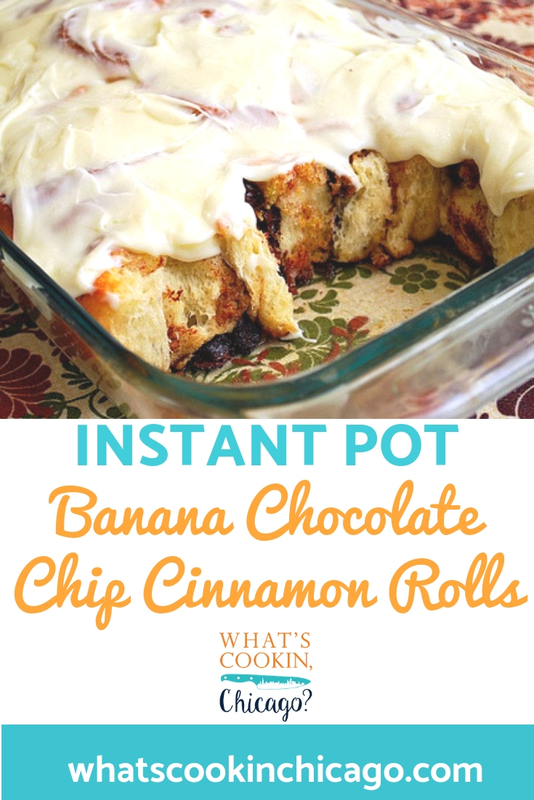 Well, that's exactly what I did when I made these Overnight Banana Chocolate Chip Cinnamon Rolls recently, using the Instant Pot as my dough proofer. The banana and chocolate combination works so well and makes every bite of this roll a delicious one. 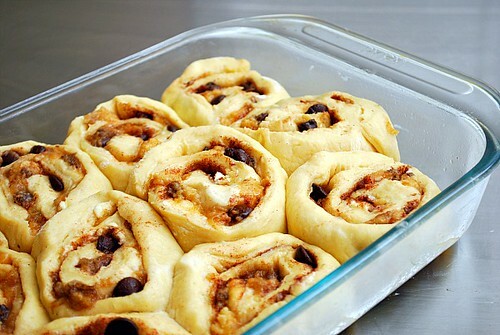 This recipe takes cinnamon rolls to another level. Even better is that you can make the rolls in advance and have them ready to bake up in the morning while you wait for the coffee! Bursts of sweet banana are found in every bite while studded in between the layers are chocolate chips. It will open up your mind to other flavor ideas that can be used too! For the dough: In the bowl of a stand mixer, sprinkle the yeast over the water, allow to bloom for a few minutes, then whisk until smooth. Whisk in 1/2 C of the flour. Cover with plastic wrap and let stand in a warm spot for about 30 minutes. Add the eggs, sugar, butter, salt, and remaining 4 cups flour to the yeast mixture. Fit the mixer with the dough hook and knead on medium speed until smooth 10-12 minutes. Add a bit more flour to reduce stickiness if needed. Transfer dough to the Instant Pot insert. Place in Instant Pot and secure the lid. The valve can be set to either SEALING or VENTING - it doesn't matter because the dough will not be cooking under pressure at any time during this process. Press YOGURT.... and press ADJUST and using the "+" or "-" set the display to reflect 2:00, which is 2 hours. We are using the Instant Pot as a dough proofer and no pressure cooking will be done for this recipe. After the 2 hours are up, your IP will beep. Remove the lid from your IP. For the filling: Butter a 9×13 baking dish. Transfer the dough to a floured work surface. Roll out into a rectangle about 15×10 in. Spread with softened butter and sprinkle with brown sugar and cinnamon. Place dollops of mashed banana mixture evenly over top and sprinkle with chocolate chips. Starting from long end, roll up into log shape. Using a sharp knife, cut 1 inch slices and place cut side up in baking dish. Cover tightly with plastic wrap and place in the fridge overnight. The next morning, remove from refrigerator and let rise until half again as high, about 1 hour. Preheat the oven to 350. Bake until golden brown, about 30 minutes. Let cool in the pan for 15 minutes. Meanwhile, prepare the frosting. For the frosting: In the bowl of a stand mixer, cream the cream cheese and powdered sugar together. Slowly add the heavy cream 1 tablespoon at a time until desired consistency. Frost the warm cinnamon rolls with half the frosting and wait 10 minutes before topping with the remaining half of frosting. This ensures all the frosting doesn't completely melt away once it's applied. The result should be a nice semi melted layer of frosting on top with a creamy top layer of frosting.